Know what your communication preferences are. Try this quick Assessment to increase your self-awareness and learn about your peers and colleagues' communication preferences. Organize a Lunch & Learn. Invite your team/colleagues to complete the assessment prior to the Lunch & Learn. Ask them to write down their dominant style on a note card of corresponding color to their style (blue, red, yellow, green). Also ask them to bring their scores to the session. Foster discussion around a relatable communication situation (see below for an example). Scenario: You must comunicate to your team a change in project scope, including a shorter deadline. Pair up with someone with the same dominant style. Discuss the strengths and liabilities of your style when communicating the above scenario. Pair up with someone who has an opposite style to you. Discuss how you each would communicate the scenario to someone with a different style. What style is your manager/direct report? What did you learn about someone with a different style? This assessment comes from The Brinkman Method. Check out this Forbes article for more analysis. 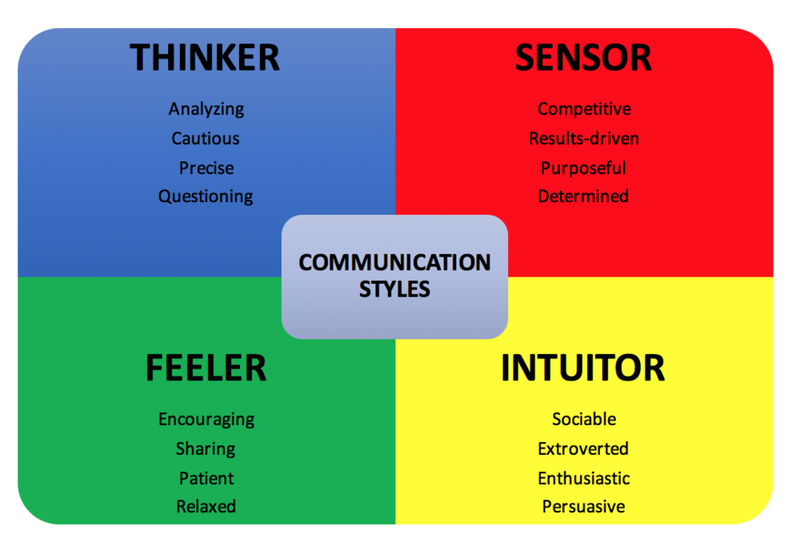 Listen to this Tedx Talk by Scott Schwefel to learn more about communication styles. Let's face it, we all have chaos at the office. Not enough hours in the day, too many priorities, never ending to-do lists, and colleagues and clients who don't respect your time. We can't control external factors. People knocking on our door, asking questions they can solve on their own, sending emails that are not relevant to us or are not clear... the list will go on for quite a while. You can't control other people's behaviors, language, and attitude. Set boundaries to manage your time better. Protect yourself from the chaos that surrounds you. Take the time to write down your responses to these questions. Reflect and decide is there anything you would reprioritize or change about how you manage your workload? 1. Imagine your IDEAL DAY. 2. Okay, NOW imagine your ideal WORK day! Really! If you could be working on anything, what would it be and how much time would it take you to accomplish? Think BIG. This is an exercise in getting out of your known reality. 3. If you only had 2 hours a day to spend on work, what would you do? 4. If you only had 2 hours a week to spend on work, what would you do? 5. If you had to remove 4 out of 5 of your most time consuming activities what would they be and why? 6. What are 3 activities that you do to “fill” time and make you feel AS THOUGH you are being productive? 7. Out of your colleagues and supervisors, who are the 3 people who contribute the MOST to you achieving your goals? Are you spending at least 70% of your time with them? 8. Out of your clients/vendors/customers who are the top 3 that contribute to MOST of your frustration? Are you able to reset expectations with these partners or cut them out? 9. If there is only ONE thing you will accomplish today, what would give you the MOST satisfaction? 10. Based on your responses create 1 or 2 goals for yourself. Ensure your goals are: 1) actionable; 2) have a deadline; and 3) are motivating to you. Now, get started on creating your most productive, successful day! *Remember that in general, folks in finance, law, health care, accounting, and academia, as well as older generations may expect a more formal introduction, so a "Hi John" will not cut it. You can be less formal if the person has already set an informal tone in previous correspondence. Also, tech and startups tend to be informal. *Recommendation: Even when being informal, always begin with an introduction: “Hi Jessica, I hope you are well.” This helps set a friendly and open tone--a simple step towards building a non-transactional relationship. Get updates when new resources are posted! Thank you! You will receive an email notification when new resources are posted! 2. WIIFT - What’s in it for them? You aren’t sending an email to yourself, so don’t write about how your idea will serve your own interests. Craft a message that caters to your audience’s needs and frame the objective of the email with that in mind. Think: how will THEY benefit when your idea is implemented? Big picture - Often times these types are focused on leading others, inspiring, and creating strategy to drive long-term goals. When a change is introduced they are likely to ask "WHY are we changing?". They may also ask: why will this idea work, or how will this affect our long-term strategy? When crafting an email to these folks include the WHY at the beginning. Keep things simple and direct and use stories or past examples of success to illustrate how your idea will succeed. Being able to connect your idea to overall goals of your team and/or company will be key in winning them over. Detail-oriented -These folks are often the scientists, engineers, and data folks. They are most interested in HOW your idea will be implemented. When confronted with change, and if they cannot see the steps leading to the end goal, they are likely to say, “This won’t work". Make sure you include plenty of data, statistics, evidence and facts supporting your idea. Use bullets to explain steps to achieving your idea. Provide additional details in spreadsheets/graphs/charts. 4. What questions or doubts can you answer? Bottom-line - your counter argument should include facts and data focused on cost-benefit analysis, profits, resource usage efficiency, and time savings. Customer/employee oriented - your counter argument could be a story that reveals past successes and achievements to help them visualize positive benefits for the future. You may mention that you have already received buy-in and support from other team members and clients. 4. Make it easy on them to say "yes!" We are all busy and overwhelmed by emails all day. Wouldn’t it be nice if someone solved some of the problems for us? When you are persuading someone of an idea, or providing them updates to a project, ensure there is a proactive tone to your email and that they won't have to do much work to make the change happen. Can you propose one or two possible solutions and let them decide which they prefer? Do you have the authority to make the decision on your own? If yes, do so. Always include yours and others' next steps. Include dates and times of follow-up and metrics that will identify when success has been achieved. This is the important part. Most of us like to ramble and barf our thoughts into an email. This is inconsiderate--expecting that others will read your mind or decipher what's going on in your brain. What does my audience NEED to know? (Make sure this at the top and stated in 1-2 sentences or bullets). What does MY audience (not me) care about that I can provide them? (Make sure this is in the body of the paragraph. Bullets are best, with the most important items at the top of the list). What are the nice-to-knows? Cut this stuff out or include as an attachment. Try to delete at least ¼-½ of what you wrote. Coaching is a key part of your core responsibilities as an effective manager and leader on your teams. And just because you may have coached a high school soccer team does not mean that you are equipped to coach your direct reports in the office. Coaching takes practice and constant checking in with yourself and your coachee. Here are some ways to improve your coaching skills in the work environment. 1. Create a safe environment. In order to coach someone you need them to trust you. If you haven’t had a good rapport with this person in the past, you have some catching up to do. Start learning more about them, asking about their interests outside of work, and looking for commonalities between the two of you that you can see eye to eye on. 2. Set up an informal routine. Coaching is about conversations and setting up regular communication with your coachee. This shouldn’t only consist of a formal weekly check-in, although that can help. Find informal ways to connect such as getting coffee together, taking breaks, going for walks, or connecting over happy hour. Thank you! You will receive email notifications when new resources are posted. 3. Align interests to goals & objectives. It is important to guide your coachee in identifying their strengths and genuine interests when it comes to being successful at their job. The end goal for you is to get them to be highly engaged in delivering great services and products. Learn more about what motivates your coachee at work (new projects, perfecting a new process, visibility from higher ups, etc.). Then offer them opportunities that connect their interests to their core role and responsibilities. 4. Listen and observe. This is the most important part--when you are in conversation with your coachee, you should be doing less than 20% of the talking! Things to keep in mind - avoid multi-tasking, show engaged body language (eye contact, nodding your head, smiling...etc. ), try to see it from their perspective, and clear your own objectives. Avoid the temptation to steer the conversation in one direction of the other. Give your coachee full freedom to drive the conversation. If you find they are not talking, try step 5. 5. Ask the HOW and WHAT questions. Your job is to ask open ended questions and get them to solve their own problems and come up with new ideas. Questions such as, “How will you deal with the next client?” “What is your thinking process when you don’t know the answer right away.” “What steps will you take to prepare for this upcoming presentation?” If your coachee says, “I don’t know…” don’t take that as their final word. Ask them, “What would you say if you knew?” or ask them to think of a few options before you put in your two cents. 9. Be open to feedback yourself. Have you encouraged your coachee to provide you feedback on your managerial style? If not, give it a try and check yourself. Are you likely to get defensive? Are you able to ask for clarification if something is not clear. What is your body language saying when someone gives you feedback? Can you coach your direct report into becoming an excellent coach as well? This is just the beginning of developing yourself into an effective coach. More tips and tools will be coming in the next few weeks on each of these steps!